Gift ideas for girls that won’t break the bank or break you up. Brooks Brothers Ring – Put a (bow tie) ring on it. Nisolo Mendez Flats – Ohmygod, shoes. Based in Nashville, empowering people in Peru, can’t go wrong with any of their styles. Firefly Sweet Tea Bourbon – Sweet like her. You have permission to use that line. Pewter Julep Cup – Get it monogrammed for extra points. Tomboy Style by Lizzie Garrett Mettler – Every girl needs a little more boy in her. That’s what he said. 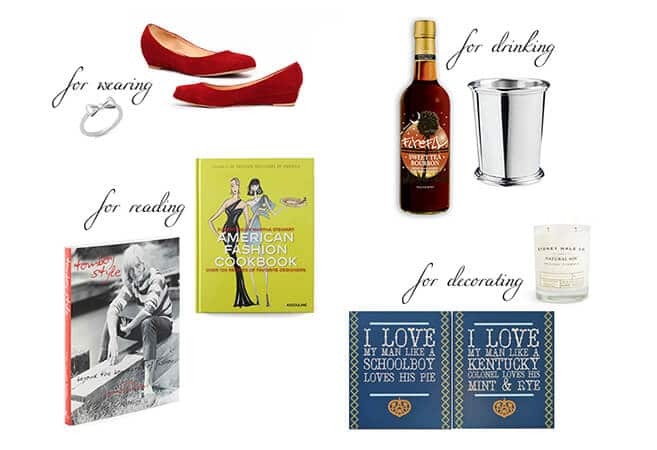 American Fashion Cookbook – Over 100 recipes of favorite designers for the girl who likes to don an apron. Garland & Pendant “Pair of St. Louis Blues” wood signs – Hand painted in Johnson City, TN. Plus, Awww, so sweet! Syndney Hale Co Candles – The best…ever! Tobacco & Sandalwood and Agave & Honeysuckle are my favorites. Bonus: once the candle is done, the container becomes a great drinking glass or vase.